Minifigures are simply the best gift to give as a toy for your child.This toy sparks your child's creativity and imagination. 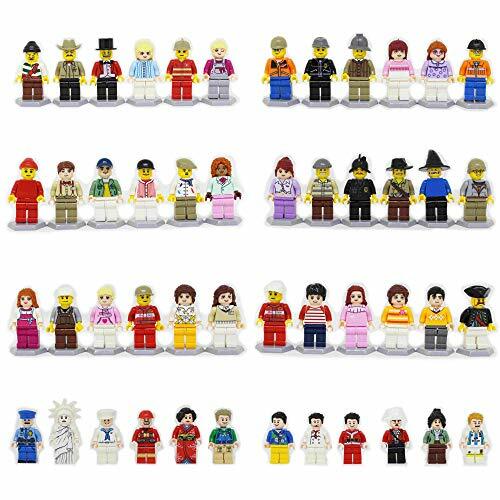 Each mini figure has its own set of accessories that can be swapped to create a new character! They can use the fine characters to play different character roles. 1.Each of the 48 figures included in this set is a colorful character in and of itself. 2.Each minifigure guy has a distinctly defined look that reflects that character's position or occupation within the community. 3.Countless interactions and scenarios spontaneously spring up when these figures are on hand, allowing children to delight in their own creativity while exploring life's possibilities through imaginative play. 4.Designed to be fully compatible with other major building block brands(MAY NOT WITH DUPLO), these figures people are sized just right for the play needs of kids ages 3 and up. 1.All products we sell are in new condition and checked carefully before shipment. 2.We provide a 90-day Free Money Back Guarantee if you are not satisfied with the item received. 3.If you have any question, just contact us, we will do our best to help you. Homecoming Kids is an individual brand that has a high production value and meticulous manufacturing standards. All the minifigures we sell are 100% brand new and created with exceptional detail. Best of all,we offer them at reasonable prices! Our quality is consistent all throughout, from manufacturing and inspections to sales and post-sales support. We have over a decade's worth of experience in the business, which helps us in maintaining a high level of productionion quality for our minifigures. We are proud of our products and we'd love for our customers to be delighted with what we have to offer. MINIFIGURES SET: This product includes 48 minifigures, package of accessories including: Phone, Fish, Carrot, Scissors, Etc. PACKAGE:Every mini people is in independent package, more convenient to install. CREATIVE ROLE: provide real benefits to child's learning, from improved hand-eye coordination to enhanced problem-solving skills. They stimulate child's creativity and imagination. SAFETY:Toy safety is very important. All of our toys are made of the finest materials to ensure quality, safety and durability. PRODUCT SPECIFICATIONS:This product is safe for ages 3 and up. Figures measure about 2 Inch H and perfectly work with all other major brand pieces but may not with Duplo. If you have any questions about this product by Homecoming Kids, contact us by completing and submitting the form below. If you are looking for a specif part number, please include it with your message.